The Bengals will begin their offseason workout program on April 16. OTAs are May 22-24, May 29-31 and June 4-7. They'll hold a mandatory minicamp on June 12-14. Spent 45 minutes catching up with some of the Bengals players for the first time since the 2017 season ended, and the biggest takeaway I got from the offensive players was how new everything was going to be. They've been essentially been using the same offensive framework and philosophies since Jay Gruden's tenure (he left in 2013), and based on what Andy Dalton said, everything is changing this year. This is Bill Lazor's chance to actually put his stamp on things. Andy Dalton repeatedly said that 'everything' was different this year, including "the way we're going to be calling things, the way we're going to be doing things ... There's not much that's the same." Dalton said it's a 'complete change on offense.' He said: "What we were doing before was basically Jay (Gruden's) offense with the adaptation of Hue (Jackson), he put his stuff on it, then (Ken Zampese) took over and he did his thing. Now we're starting from Square 1. This is all new." Joe Mixon reported Monday a bit svelte. Marvin Lewis may be going into his 16th season as head coach, but some of his most veteran players on both sides of the ball sound like they’re going back to their rookie seasons. Wide receiver A.J. Green, who has commandeered this offense since he and Dalton arrived with coordinator Jay Gruden in 2011, says he’ll have to adjust to a new way of calling pass routes since current offensive coordinator Bill Lazor is going with the number tree rather than the word-based system of Gruden’s offense that has been the base of the scheme for seven seasons. Lazor, who has crafted his own playbook since he got the job on a permanent basis back in January, has also surrounded himself with a new offensive line coach in Frank Pollack, a new receivers coach in Bob Bicknell and a new quarterbacks coach Alex Van Pelt. “Anytime you’ve got that many new coaches it’s going to be different,” Green said. Coordinator Teryl Austin is the only change on defense, but linebacker Vincent Rey, a rookie in 2010, already sees a difference between what he’s played in the last eight seasons under Mike Zimmer and Paul Guenther. “It looks to me like we’re going to be more multiple,” Rey said. TAG-TEAM: Even though Monday was former Bills middle linebacker Preston Brown’s first day of work in Bengaldom after signing a one-year deal last month, it was just another off-season workout with him for Rey. The two know each other well as workout partners for the past five offseasons at Ignition Sports in Mason, Ohio. So Rey has watched tape of him down through the years because he wanted to keep tabs on his friend. JOE IN THE MIX: Running back Joe Mixon looks nowhere like the guy that showed up at rookie minicamp last season. He figured he was 238 pounds then. Now after a full offseason of working out rather than traveling around the NFL he’s a svelte 225 pounds and he’s looking to drop five more. “Trying to get a step quicker,” he said. STATE OF QBS: Paul Dehner Jr., of The Cincinnati Enquirer via Pro Football Talk.com keenly observed Louisville quarterback Lamar Jackson in the locker room Monday, suggesting he’s one of the Bengals’ 30 prospects making an on-site visit. You may have to file that one under due diligence. Even though the Bengals have signed journeyman vet Matt Barkley for the derby to replace backup AJ McCarron, it’s believed they might start getting interested around the fourth round or so for a rookie QB. Jackson will be long gone by then, but, knows? Who knows what happens above them at No. 21? Or if somebody, like them, trades back? That’s why they call it due diligence. The improving health of No. 3 QB Jeff Driskel, as well as the Barkley signing, would seem to quell an urgent need for a back-up QB. Driskell said Monday his broken non-throwing arm feels excellent and he’s hoping he can get cleared in time for the on-field drills when they start in late May. Driskel missed most of the year when he fractured his throwing hand in the pre-season finale. But they really like his athleticism and that’s how he got hurt in the last week of practice. With numbers dwindling at receiver they asked Driskel, a former Red Sox draft pick, if he wanted to jump in on the scout team and he didn’t hesitate. On one play he leaped to make a one-handed catch with his right hand. But he got jostled, lost his balance, and when he hit the ground he shattered his left arm. This is also why this team was so predictable. Everyone knew what was coming. What a difference a better approach to free agency brings. This season they start day one as a MUCH better team. Because they solved OLT months before the draft and added another iron horse LB for the middle. The draft is gravy. Change is good..and for this team probably mandatory. They've tried to get by with doing different versions of the same old thing, but IMO making matters much worse the ex-coaches who used to run things here are now doing the same things in other places. I wish I had more faith in Lazor because one of the things I'm most excited about is an offense that isn't built around John Ross but rather...one that uses him as a building block. Last season there was no plan. Mixon at 220 pounds? Sounds good to me. I think Mixon is a much more dangerous weapon as an air back. Not sure about the bell cow role but admittedly he's never had Cordy Glenn/Clint Boling tandem to run behind before. At minimum that's the start of a running game...and I for one won't dismiss what the Bengals got out of Westerman and Redmond late in the season. I like the sound of being more multiple on defense as well. More snaps for Carl Lawson at LB for starters. Perhaps a few different looking body types added in the draft. I was encouraged by some of what Hobs outlined re: change. Offense got stale and ineffective for sure. And the D got worse, especially on 3rd down. The draft will be telling as far as how the D might be different (e.g. the 3-safety talk and how they address the front 7 with being multiple and as such using different body types, as HOF mentioned), and also just how they view some of the positions and the younger guys they already have (e.g. Fisher, Billings, Evans and Vigil, interior OL, and TE). Count me in as also pleased with a change in the offense's approach, terminolgy, etc. 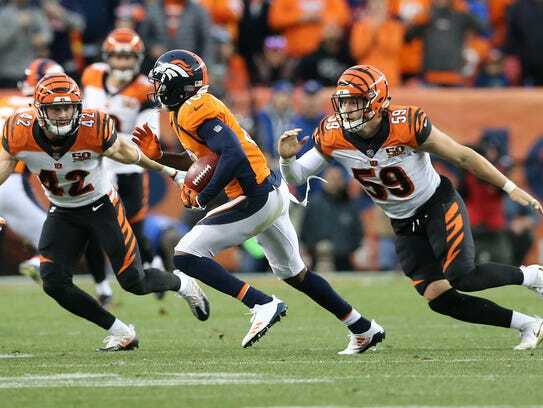 I can't imagine how easy it was for teams that play the Bengals a lot to have been ready for them (given that most of us could call the plays based on down, distance, and how they were lined up). In fact, Joe Goodberry's years-long crusade about how Dalton was bad against "common opponents" likely goes back to that. Not to mention that Dalton himself at this point in his career (and Green and others) could probably use a fresh approach just to shake things up. The new coach I am most optimistic about on the offensive side is Pollack. The o-line needed a fresh voice and approach in the most obvious of ways. Last edited by membengal; 04-17-2018 at 08:38 AM. The Cincinnati Bengals, officially, got back to work on Monday with the start of voluntary workouts at Paul Brown Stadium. It was the first day players were able to receive playbooks from offensive coordinator Bill Lazor and new defensive coordinator Teryl Austin, as well as meet with new position coaches like Alex Van Pelt (quarterbacks), Bob Bicknell (receivers) Frank Pollack (offensive line) and Daronte Jones (cornerbacks). installations of schemes and plays. linemen who ended 2017 on injured reserve. "I've been doing pretty much everything that you would do in an offseason – lifting and running and all those types of things," he said. Eifert said he still isn't allowed to squat or perform exercises that "loads the spine" as he called it, but feels he's progressing. "It's important to stay healthy whether you've been hurt or not, but I think I'm obviously in a unique situation with the amount of games I've missed,"
he said. "I'm doing everything I can as far as maintenance goes and all that stuff so I can stay on the field – just doing what I can." was rehabbing a severely sprained ankle. to put me on IR,” he said. players are back in the mix and fully healthy. reserve. He had surgery shortly thereafter to correct it. “It was last year, I’m pushing forward, got it fixed and really just taking the time now to work on me and apply everything I’m going to learn here the next few weeks and take it into next season,” he said. On Feb. 23, Fisher was cleared to resume all football activities, but for him, there wasn’t a question of not continuing the sport after it was determined he would be healthy enough to resume it. On Dec. 16, T.J. Johnson was placed on injured reserve when he tore his pectoral muscle during a weightlifting session. Fortunately for the fifth-year center, he only tore the muscle and not any ligaments, so he was cleared to resume activities in the winter. “I got healthy,” he said. “I started training a little early because I got a little earlier time off than everybody else. So I started back a little sooner than I normally do. 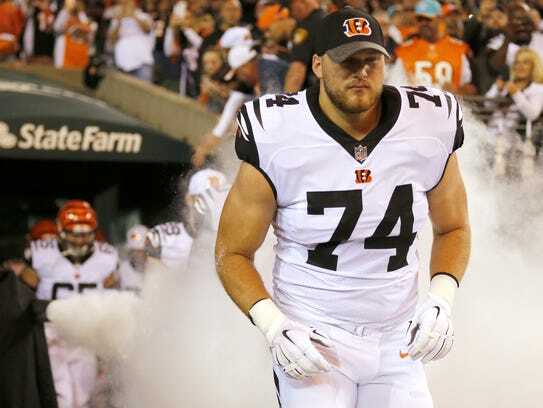 With Russell Bodine departing to Buffalo via free agency, Johnson is now the only true center listed on the Bengals roster. Meet the new Bengals offensive tackle, Cordy Glenn.